TEMPORARILY OUT OF STOCK...Monogram large canvas duffel bag. A roomy and spacious canvas carry all bag is a must-have for a weekend trip away. Pack everything you need into this fabulous bag and you will still have space for your latest novel and sunglasses. The colors are stunning in your choice of red-navy, khaki-navy or natural-grey. High end finishing with contrast top stitching, quality zipper closure, and padded shoulder strap for long journeys. A luxurious bag that will serve the purpose for a business or pleasure trip. Superior craftsmanship and materials will make this your favorite travel tote for many years. 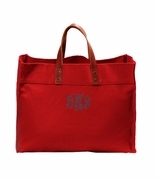 Add your embroidered monogram for a classy finish to this canvas duffle bag. Great graduation gift, retirement present or groomsman thank you gift. FONT FOR FIRST, LAST, MIDDLE WILL BE THE CIRCLE EMBROIDERY SHOWN ON THE RED DUFFLE. FONT FIRST, MIDDLE, LAST WILL BE EMBROIDERY SHOWN ON THE KHAKI DUFFLE ALL LETTERS THE SAME SIZE. 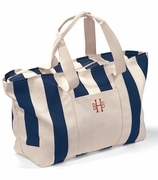 Monogrammed embroidered large canvas duffle measures a generous 25"W x 15"H x 10" across bottom. Inside open wall pocket, folds flat for storage. Received this bag as a bridegrooms gift. WOW - what a stylish and sturdy bag. The monogram adds a touch of class. I'd give it ten stars if I could.